Coevolutionary Medicine? « Nothing in Biology Makes Sense! Antolin starts by outlining a case study in which a small boy in the midwestern United States falls ill of a bizarre disease the origin of which is unknown. He has up to date vaccinations, has survived all normal childhood illnesses and has no known allergies. It turns out the family had recently acquired a prairie dog, which was caught from the wild. 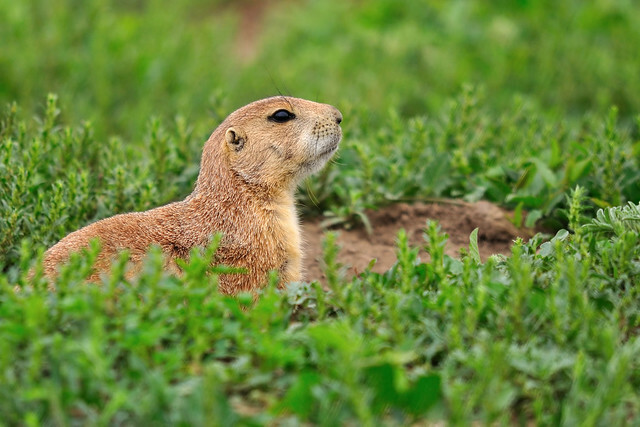 Prairie dogs in the US are known to harbor a number of icky diseases, such as tularemia and bubonic plagues. However, the boy’s rash ruled out either of these diseases. It turns out that the pet prairie dog came from an animal facility in Chicago where it was housed with Gambian rats carrying monkeypox, a close relative of the human pathogen smallpox. The Gambian rats passed on the monkeypox to the prairie dog, and then the boy caught monkeypox from his new, adorably disease-ridden pet. 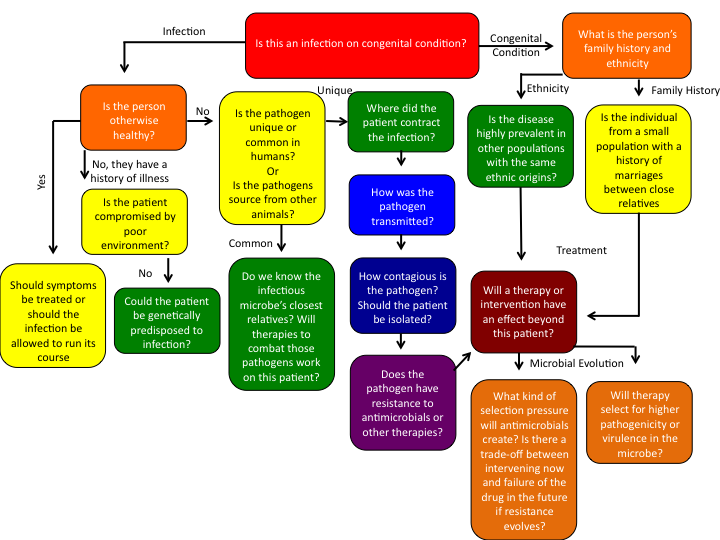 Understanding host shifts and the evolution of pathogens allowed doctors to diagnose and cure the boy and his family, and prevent the spread of what is otherwise a deadly disease. Without this knowledge of evolutionary biology, the awareness of how the pathogen shifted hosts and the genetic determination of the origin of the plague, an epidemic most certainly would have taken hold in the small town in America where our story took place. This combination of public health knowledge and evolutionary concepts is what distinguishes Darwinian medicine. In the above case, the virus was isolated, the epidemiology examined and the DNA analysis confirmed that the virus had originiated in Africa and had indeed shifted through two different animal hosts before infecting humans. Most of Antolin’s commentary could serve as a guideline for how to bridge the gap between medical knowledge and evolutionary biology. Most importantly for those of us who get our jollies from coevolution, he touches on the importance of understanding how disease has, or maybe has not, played a role in human evolution. Antolin also notes what I think is incredibly important in evolutionary medicine, that doctors should think like population geneticists. That is, medicine should consider natural selection as a force in an ever-changing adaptive landscape, but also how the non-adaptive forces of mutation, drift, and small populations affect human disease prevalence. Antolin even goes so far as to include a decision tree for doctors who might be treating a patient to think through the diagnosis from an evolutionary perspective. A medical decision tree with evolutionary perspective; reproduced with permission from M. Antolin. What fascinates me about this subject is that I was completely, totally and utterly uninterested in it when I came across the FULL DAY symposia on evolutionary medicine at the Evolution meetings this year in Oklahoma. As an evolutionary biologist I have been trained to be disinterested in medicine. Most evolutionary biologists revile those silly premed students and have little interest in medical research. I fell happily into that crowd. But the more I think about evolution being applicable the more I can’t help look for people who see evolutionary medicine as not just important for us evolutionary biologist to consider, but imperative for the general medical population to adopt. So although I’m a neophyte in this field myself, I hope to continue bringing evolutionary medicine (and putting the appropriate coevolutionary spin on it) to the masses through my blog posting. This blog post has been submitted to the NESCent blogging competition for the ScienceOnline 2012 conference. This entry was posted in coevolution, medicine. Great first post, CJ! So, from your reading, what would you say is the single most important insight evolutionary biology offers medical practice? Is it the idea that bacteria or viruses within a single patient are often a variable population, or that shared evolutionary history among pathogens should predict the effectiveness of treatments against them? Or something else entirely? I think it’s something else entirely and the strongest thing evolution has to offer medicine is the knowledge that the genetics of the patient, and how genes vary within and between populations changes the susceptibility to disease, prevalence and treatment. Although it is important to understand an infection is a population of pathogens, I think the goal of evolutionary medicine is to get doctors to understand that people are not uniformly the same, and to consider this when diagnosing and treating patients. This dude seems pretty negative about the contribution of genomics (including insights into evolutionary process that it provides) to at least one major disease. I feel like I hear that echoed quite a bit when it comes to actually useful medical applications of all this awesome knowledge we are generating through sequencing technologies. @noah — The issue identified in that column seems to be more about research priorities than the usefulness of new methods. Which is a legitimate problem, but it still assumes that genomics/evolutionary medicine would be useful, if only we’d put the resources into using them. On the other hand, I believe there have been rumblings about the failure of GWAS studies of human genetic diseases and disease risk factors to identify “useful” variants—does knowing you have a SNP associated with a 5% increase in heart disease risk really tell you anything meaningful from a treatment or prevention strategy perspective?